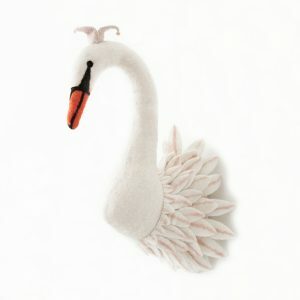 Graceful and beautiful hand felted Odette swan head by Sew Heart Felt. Odette wears a powder pink crown with tiny golden bells; her delicate feathers are also tipped prettily with pink. Odette is skillfully created by shaping organic wool with soap, water and applying hand pressure. Fine needle felted detail to her face and delicate appliqué feathers bring the gorgeous Odette to life! 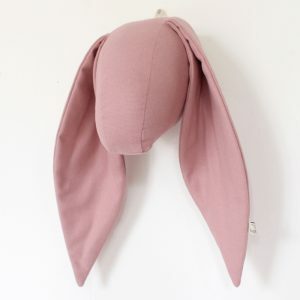 Each Sew Heart Felt animal head is a truly artisan piece and unique in its own right. Beautifully presented in an organic cotton Sew Heart Felt draw string pouch. 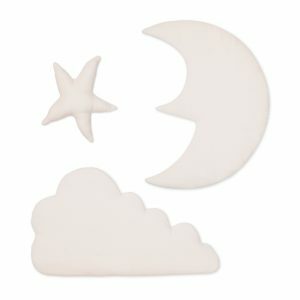 Bring the night’s sky into your little one’s bedroom or nursery with this gorgeous wall hanging from Cam Cam Copenhagen. The light pink tone matches with almost any decor, from monochrome to pastel and Scandinavian neutrals. Each piece is made from soft 100% organic cotton, filled with allergy-friendly polyester and backed by an inner board made of 74% organically grown materials. The baby corduroy texture of the fabric is soft to touch and incredibly tactile for little hands. Small loops on the back make it easy to hang and move whenever you’d like Cam Cam Copenhagen was founded by a Danish architect couple. Their design philosophy combines traditional techniques with contemporary aesthetics and all their products are made using organic, sustainably-grown materials where possible. 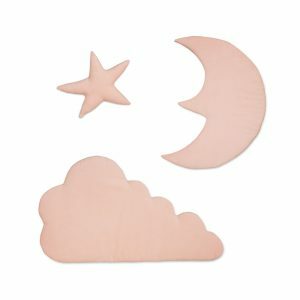 Bring the night’s sky into your little one’s bedroom or nursery with this gorgeous wall hanging from Cam Cam Copenhagen. The light grey tone matches with almost any decor, from monochrome to pastel and Scandinavian neutrals. Each piece is made from soft 100% organic cotton, filled with allergy-friendly polyester and backed by an inner board made of 74% organically grown materials. The baby corduroy texture of the fabric is soft to touch and incredibly tactile for little hands. Small loops on the back make it easy to hang and move whenever you’d like Cam Cam Copenhagen was founded by a Danish architect couple. Their design philosophy combines traditional techniques with contemporary aesthetics and all their products are made using organic, sustainably-grown materials where possible. The Numero 74 Bunting Garland is incredibly whimsical and charming. It’s beautiful design makes it the perfect decorative piece for your child’s bedroom or nursery. Hang it above the bed, along the wall or even add it to a Numero 74 canopy tent to inject an enchanting element into your little one’s favourite space. 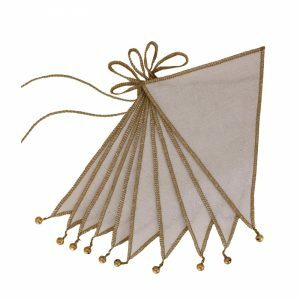 Measuring just over two metres in length, the mixed beige bunting garland with bells promises to be an incredible standout feature in any room and fill it with plenty of magic. This lovely and easy-to-hang garland is designed in Italy and ethically handmade in Thailand within a self-managed women’s collective. The Numero 74 Bunting Garland is incredibly whimsical and charming. It’s beautiful design makes it the perfect decorative piece for your child’s bedroom or nursery. Hang it above the bed, along the wall or even add it to a Numero 74 canopy tent to inject an enchanting element into your little one’s favourite space. Measuring just over two metres in length, the powder bunting garland with bells promises to be an incredible standout feature in any room and fill it with plenty of magic. This lovely and easy-to-hang garland is designed in Italy and ethically handmade in Thailand within a self-managed women’s collective. 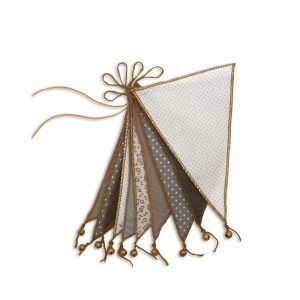 The Numero 74 Bunting Garland is incredibly whimsical and charming. It’s beautiful design makes it the perfect decorative piece for your child’s bedroom or nursery. Hang it above the bed, along the wall or even add it to a Numero 74 canopy tent to inject an enchanting element into your little one’s favourite space. 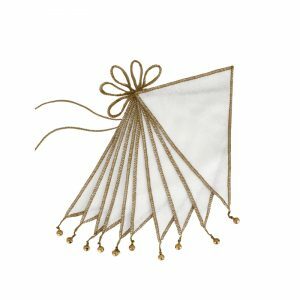 Measuring just over two metres in length, the white bunting garland with bells promises to be an incredible standout feature in any room and fill it with plenty of magic. This lovely and easy-to-hang garland is designed in Italy and ethically handmade in Thailand within a self-managed women’s collective. 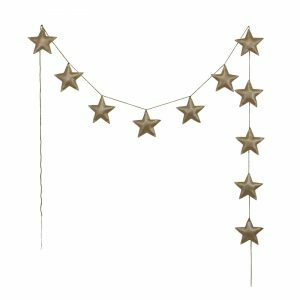 The Numero 74 Star Garland is incredibly whimsical and charming. 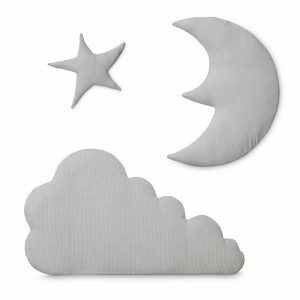 It’s beautiful starry design makes it the perfect decorative piece for your child’s bedroom or nursery. Hang it above the bed, along the wall or even add it to a Numero 74 canopy tent to inject an enchanting element into your little one’s favourite space. 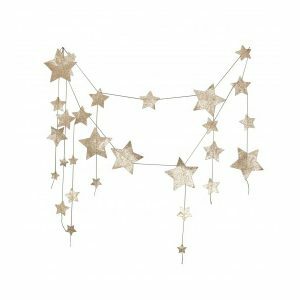 Measuring two metres in length, the star garland with its glittering gold stars promises to be an incredible standout feature in any room and fill it with plenty of magic. This lovely and easy-to-hang garland is designed in Italy and ethically handmade in Thailand within a self-managed women’s collective. Bring the wonder of a starry night into your home with the Numero 74 Mini Star Garland. The gorgeous garland is perfect for your child’s nursery, bedroom or play space. Sure to fill any room with an enchanting and magical atmosphere, this lovely 2.5m star garland is an excellent decorative addition to your home. Hang it above the bed or on the wall for a fabulous feature in your child’s space. The padded stars are soft, charming and oh-so-cute. Made from glittering gold cotton and filled for a cushioned finish, this wonderful wall-hanging has a great feel for a kid’s space. The Numero 74 Star Garland also makes a lovely and unique gift that is sure to delight. Be careful, though. Once you buy it, you may be tempted to keep it for your own home. Bring the wonder of a starry night into your home with the Numero 74 Mini Star Garland. The gorgeous garland is perfect for your child’s nursery, bedroom or play space. 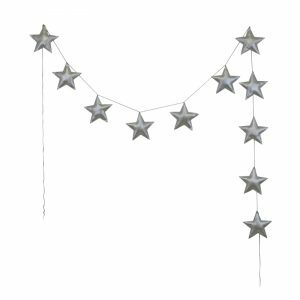 Sure to fill any room with an enchanting and magical atmosphere, this lovely, 2.5m star garland is an excellent decorative addition to your home. Hang it above the bed or on the wall for a fabulous feature in your child’s space. The padded stars are soft, charming and oh-so-cute. Made from glittering silver cotton and filled for a cushioned finish, this wonderful wall-hanging has a great feel for a kid’s space. The Numero 74 Star Garland also makes a lovely and unique gift that is sure to delight. Be careful, though. Once you buy it, you may be tempted to keep it for your own home.